The shift of Jewish life from Israel to Babylon marked a transitional period fraught with danger. Luckily, such leaders emerged and set the foundation for Jewish life until today. Rabbi Judah the Prince marks the end of a period known as the era of the Tannaim, which lasted approximately until 200 CE. A Tanna (pl. Tannaim) is one who mastered, taught and engaged in the study of the Mishnah and its attendant works. The ensuing period — from 200 CE until about 550 CE — is called in Jewish history the Era of the Amoraim. The Amoraim were the ones who elaborated upon the Mishnah and whose discussions fill the pages of the Talmud. One could say that the Talmud is a transcription of lectures, conversations, discussions and stories that occurred in the academies during those 350 years. After the destruction following the failed Bar Kochba revolt (circa the year 140 CE and onward) the Jewish population in the Land of Israel diminished… and continued to diminish steadily, like a graph going downward in a straight line. Jews were moving from Israel to Babylon, not the other way around. There were people that would come from Babylon to learn in Israel for a year or two, but then return to Babylon. These visiting scholars, so to speak, created an effective cross-pollination of ideas and differing viewpoints. Nevertheless, most the traffic was one way: leaving the Land of Israel. This was especially true after the death of Judah the Prince. With his death the ascendancy of the Babylonian Jewish community over the community in the Land of Israel began in earnest. When Judah the Prince died the disciples who survived him were a collection of some of the greatest men in the history of the Jewish people. And such a collection was needed to make it through the difficult times ahead. It was a transitional age – which is always the most difficult and dangerous of times. The transition encompassed the shifting center from Israel to Babylon, from the Tannaim to the Amoraim. The transition really is from an independent Jewish people to a completely subservient, Diaspora-oriented Jewish people. Special leadership was needed to blend them together while not losing their unique qualities. There are many such leaders to discuss, however there are five main ones especially worthy of mention. These five lived in the generation after Rabbi Judah the Prince. The last of them lived until about 240 CE. They laid the foundations for the Talmud and the Jewish way of life in existence today. Rabbi Chiya had a nephew who was called Rav, but whose real name was Abba (and who is sometimes called in the Talmud, Abba Aricha, “Abba the Tall”). He had come from Babylon to Israel to study in the academy with Rabbi Judah the Prince. Indeed, he made the trip between the two lands a number of times. He was relative unknown until he reached his sixties. He is the man who, more than anyone else, made Babylonian Jewry. He settled in the city of Sura, one of the main cities in Babylon, the same city where the prophet Ezekiel lived when he came with the exiles of the First Temple era. Ezekiel had founded an academy which was then close to 700 years old by the time Rav became head of it and turned it into the foremost house of Jewish scholarship not only in Babylon but anywhere in the world. Indeed, it remained the “Harvard” of Jewish academies until around 1000 CE. From the time of Rav onward, the person who headed the academy in Sura was the spiritual head of the Jewish world. Rav had a compatriot by the name of Shmuel, who was head of the Jewish community in Neharda, which means the “City of the River” (a reference to the Euphrates). Shmuel not only was an expert in all Jewish subjects, but an incredible astronomer well. The Talmud remarks about him that he was as familiar with the pathways of the stars in heaven as he was of the pathways of the streets of Neharda. While Rav headed the great academy in Sura, Shmuel headed the great academy in Neharda. They were the originators of the give-and-take in the Talmud, which is the hallmark of the Talmud. They had differing opinions on most subject matters. These opinions were recorded, discussed and analyzed. When Shmuel died, Rav wept and said, “The man that I feared has died.” By that he meant to lament over the fact that now there was no one equal to him in Torah knowledge, no one whose opinion was a serious challenge to his own. In the Land of Israel, the two great people of this transitional generation were Rabbi Yochanon and his brother-in-law, Rabbi Shimon ben Lakish, also known as Reish Lakish. The Talmud remarks that Rabbi Yochanon was one of the handsomest people in the world (even though he did not have a beard, which the Talmud reckons as a defect in his handsomeness). He lived a terribly tragic life. He had 10 sons who died before him, but was able to use his personal tragedy as a source of comfort to others who were bereaved. His entire program in life was to help others, to be kind and considerate. He was the main editor of the Jerusalem Talmud. (It was edited after him as well, but he was the primary editor.) In his lifetime, he kept the academies in Israel strong. While he and Reish Lakish lived, scholars traveled back and forth between Israel and Babylon. After his passing, the academies in Israel experienced almost a complete demise. Not batting an eyelash, Rabbi Yochanon convinced him on the spot to use his strength for Torah. To sweeten the deal, he told him that if he was successful he would talk to his sister to marry him. Reish Lakish agreed and then tried to jump back across the river, but could not do so. The lesson learned, the Talmud remarks, was that the acceptance of Torah weakened him. He hadn’t learned a word yet, but his commitment already sapped some of his natural, physical strength. Indeed, he put his heart and soul into learning and eventually became the great Rabbi Shimon ben Lakish, the prime learning partner of Rabbi Yochanon. Together, they built the academies in Israel. When Reish Lakish died, Rabbi Yochanon was presented with a different learning partner, a brilliant man scholar in his own right. However, he was a “yes man.” Everything Rabbi Yochanon said he agreed with. “Every time I say something,” Rabbi Yochanon remarked, “you bring me 24 proofs that I am right. However, when Reish Lakish was alive he would tell me 24 reasons why I was wrong. Woe unto me.” He lamented the fact that he was missing the critical analysis that is so necessary for true scholarship. The fiery disagreements that can go on between scholars sharpen them. “Give me a learning partner or give me death,” Rabbi Yochanon said. Sadly, he could not find a replacement for his brother-in-law and died shortly thereafter. Economically, the Jews fared very well in Babylon. They served as merchants and shippers, taking advantage of the commerce to be had along the Tigris and Euphrates Rivers, and from there all the way into the Persian Gulf and throughout the known world. 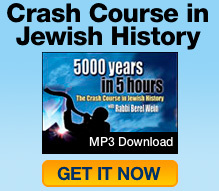 Spiritually, Jewish life was reinforced by massive twice-a-year conventions of Torah learning. These conventions took place in the months before Passover and Rosh Hashanah. Tens of thousands of Jews came to hear Torah lectures and study it in depth. The Talmud says that there were so many people in attendance that one could see a dust cloud rise from far away when the lecture was over. The Jews also had a type of autonomous government. The head of the Jewish community was called the Reish Galusa, the “Head of the Exile,” or Exilarch in Greek. He was descended from the House of David and was in actuality the pretender to the throne. If and when the Jewish community would be returned to the Land of Israel with its government he would be king. He was granted temporal powers by the Babylonian authorities, including a Jewish police force. The Reish Galusa also could collect taxes, run a court and even had the right to enforce capital punishment. Jewish life in Babylon spread out through many cities where Jews were the majority. Entire cities were closed on the Sabbath and in general moved to a Jewish rhythm, so to speak. This autonomy helped strengthen the idyllic age of the Jews in Babylon, which would become the center of Judaism for the next 800 years. While Jewish life was developing in Babylon, Rome ruled the rest of the civilized world. She suffered no serious foreign threat to her hegemony. Jews were very active in the Roman world. In the city of Rome itself, Jews formed a very influential part of the population. At the same time that Jews operated in Rome and her environs, the early Christians began to grow despite – or because – of persecution at the hands of the Romans. Jews did not participate in the persecution of the Christians, but they certainly separated themselves from the Christians. Consequently, a strong enmity between the two groups began to grow. Indeed, the beginnings of Christian anti-Semitism were laid now. The Jews in Babylon were excluded from this conflict simply because the Christians did not have a strong presence there. Indeed, Babylon remained pagan until the Muslim era. There was no real Christian period in Babylon and therefore Jews did not have to compete with them there. This might also explain why Christianity is almost completely ignored in the Babylonian Talmud. It was not an everyday issue in Babylon. Nevertheless, it was an issue in the Roman world, an issue that neither Jew nor Roman could avoid… much to their chagrin. I have been studying the history of Judaism in small part for personal and for specific research I have been completing. I appreciate your site. This was a very clear reading,I enjoyed It very much.